Getting an invite for a restaurant tasting is not anything new. I get them all the time. However, one of the most recent invites caught my attention. It didn't have anything to do with the restaurant or cuisine. Believe it or not, it had everything to do with the PR representative. You see, the name was very familiar and distinct. In fact, I've heard this name over and over again among some of my friends; yet I've never met this person. To me, I was curious. Curious to see if this was indeed the same person. Naturally, being the goof that I am, the first thing I do when I finally meet this infamous person, I totally embarrass myself. "Hey, are you the same person as my friends have been talking about?" "Uh, yah", she replies looking at me strangely like I was some crazed stalker. Alright, smooth I am not. I better stick to talking about food. Oh and yes, I was invited to the media tasting at Laziza Modern Mediterranean restaurant on Davie. 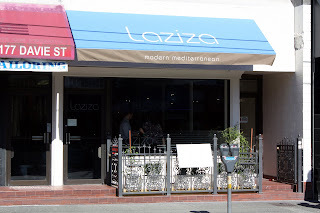 In actuality, Laziza is a "Lebanese" Mediterranean restaurant in the same vein as Nuba. For the first time, I met Rachel and Oliver from Trails of Breadcrumbs. It was nice to share a table with them and shoot the breeze about food and photography. Naturally, we snatched the only window seat for the excellent lighting. 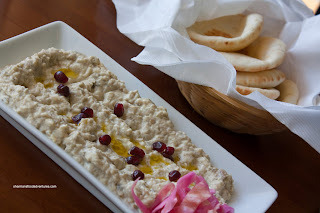 Arriving first was a Babaganoush garnished with pomegranate seeds. Texturally, this was a winner since it was a nice balance between being smooth without being over-processed. When eaten without the pomegranate seeds, the babaganoush was very mild-tasting. I would've liked to see a bit more smokiness and slightly more lemon. But when eaten with the pomegranate seeds, it did add the necessary flavours which helped liven up the dish. 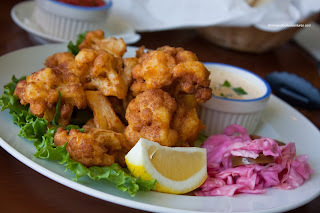 Reminiscent of a Vancouver favourite at Nuba, the Crispy Cauliflower was prepared a bit differently. There was a batter on the cauliflower which made it much crispier than the one at Nuba. However, it wasn't as pungent due to it. For me, I like both renditions and I would chalk it up to personal preference if one had to decided between the two. 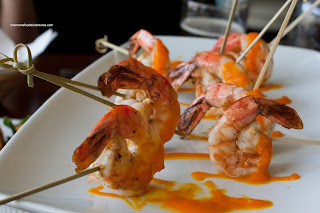 Next up was the Saffron Prawns. Beautifully grilled and exhibiting plenty of natural prawn sweetness, these were accented by a saffron aioli. The aioli was actually quite flavourful while being subtle at the same time. Just enough to compliment the prawn without detracting from it. 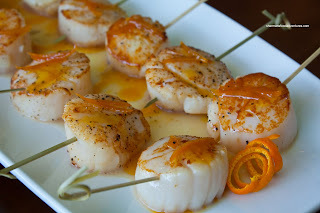 Speaking of perfectly cooked, the Seared Scallops were done just right. With an appetizing colour and just barely cooked (and I mean barely), the scallops would've been good on its own. The orange reduction along with the orange rind helped liven it up. It didn't really add a tonne of sweetness; rather it provided a light bitterness. That actually helped accent the natural sweetness of the scallops. Originally, Mijune was supposed to attend this tasting as well; but was too busy. Too bad really, if she had know there would be sausages, she'd be all over it. She loves her sausages! The Maqanik Lamb Sausages were very tasty and meaty. Sauteed with lemon and capers, the natural lamb gaminess was still quite prominent. Not in a bad way tough, it merely made its presence known despite the other competing flavours and spices. In fact, there was a nice blend of spices which accented the lamb without detracting from it. The next 2 items were salads and I have to admit that I'm not the biggest fan of greens. So maybe that is why I didn't show much enthusiasm for either. However, I didn't mind the Beet Salad with mesclun greens, beets and feta cheese tossed in a aged balsamic vinaigrette. A pretty standard salad with familiar flavours and ingredients. Nothing special about; yet nothing particularly offensive either. Now I can't be as kind to the Fatoush Salad. 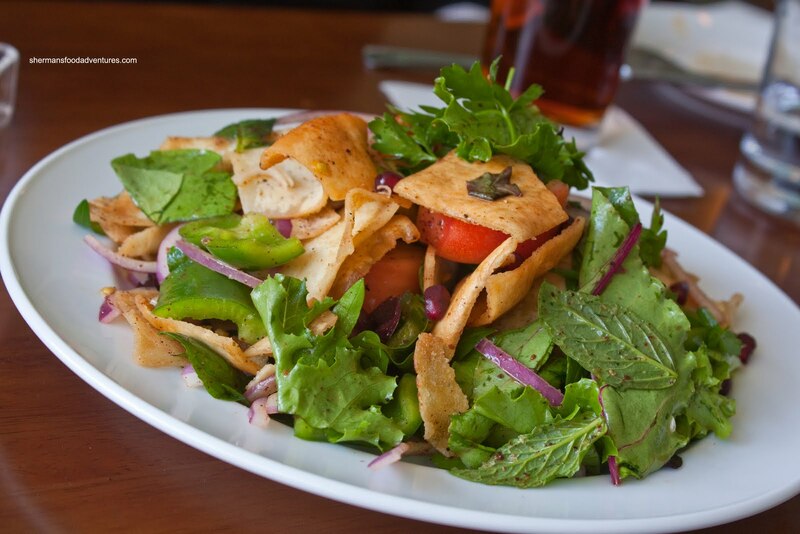 Consisting of crispy pita chips, meslun greens, tomato, cucumber and peppers tossed in lemon olive oil, it was a very difficult salad to eat. The pita chips were far too large and thick. A fork didn't suffice and neither did a spoon. The chips were crispy to begin with and ultimately met a soggy demise part-way through. 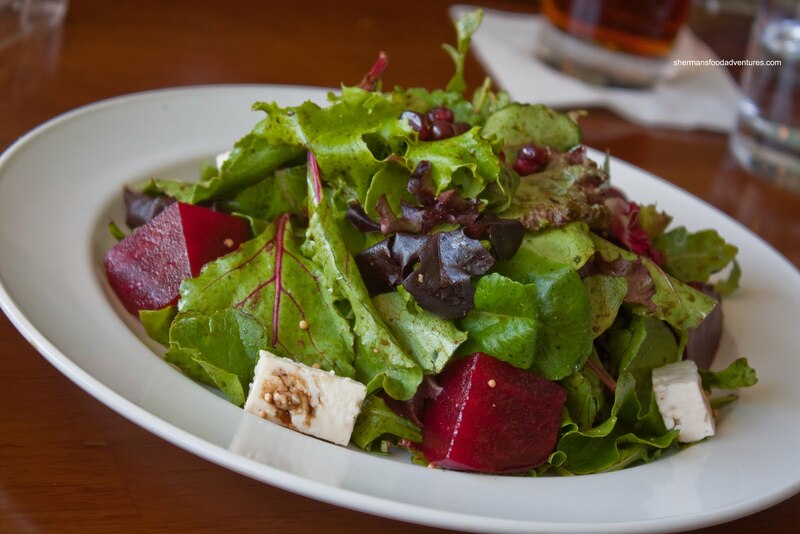 Much like the beet salad, other than the pita chips, there was nothing really wrong about it. In fact, I really liked the dressing. They did not hold back on the acidity, which really livened up the ingredients. After the leafy green interlude, we returned to the proteins in the form of the Stuffed Chicken Prawn. 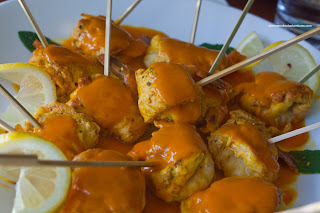 As the name suggests, this was essentially tiger prawns wrapped in chicken breast meat and topped with saffron sauce. Once again, the prawn was cooked perfectly and exhibited a pleasantly strong prawn flavour. The chicken breast meat was as moist as white meat can be (which is a tad dry; but still tender). Yet, the thing that really shone here was the lovely saffron sauce. Similar to the saffron ai0li, there was an understated sweetness and aromatic flavour from the saffron. The subtleties of the sauce was a nice compliment to the mild ingredients. However, a squeeze of the provided lemons helped intensify the flavours. 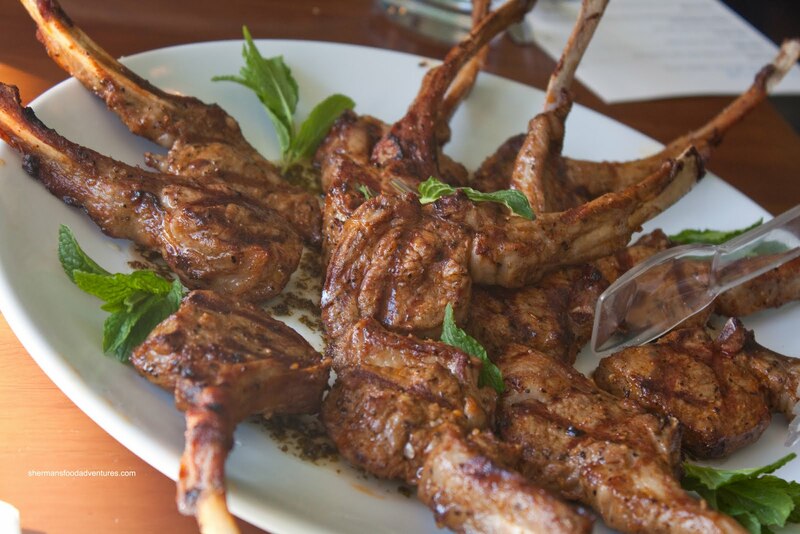 On the topic of flavours, the Lamb Chops were absolutely fantastic. These little "Popsicle" lamb chops were reminiscent of the one at Vij's without the sauce. They were grilled up perfectly with a nice colour and extremely tender meat. Very little chewing was required. The best part of these lamb chops was the wonderful seasoning which included rosemary and thyme. Add some fresh mint and the flavours were a natural fit that came out clean. For our last dish, it arrived in an attractive tagine. 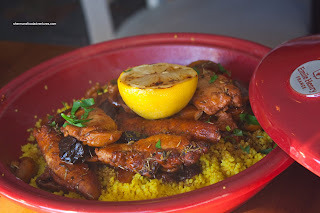 The Chicken Bedovin consisted of sauteed strips of chicken breast with dates, apricots, figs, prunes, walnuts and honey. This was all served over a bed of perfectly cooked cous cous. With a squeeze of the grilled half-lemon, the predominantly sweet ingredients were tempered by the the acidity. This dish had it all, sweet, tart, savoury and a bit of spice. Ultimately this dish was a fitting end to a surprising meal. Yes, I know they brought out their "A" game since it was a media tasting; but I'll say it again - a restaurant can only be as good as it can be, no matter the situation. Hence, I will have to say I rather liked the food here. 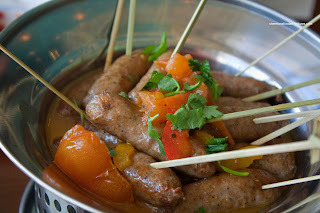 Overall, it was well-executed and the flavours were understated; yet appetizing at the same time. I would gladly return to Laziza on my own dime for sure. Great post Sherman! I'm still waiting for Oliver to post his Laziza review. Anyway, it was a pleasure meeting you :D Though it took us a year or so to finally meet but Oliver and I were so glad we finally got to meet you. And thank you for mention and linking our blog to your post! Thanks! It was nice to meet you too! Maybe we'll do it again some other time!